We offer Pilma Tablets that provide relief from Piles without Operation and No Food & Drink restrictions. Prepared from the pure natural herbs which are procured from the renowned vendors, these Pilma Tablets have no side-effects. Our Pilma Tablets are completely Ayurvedic and effective for all types of piles. 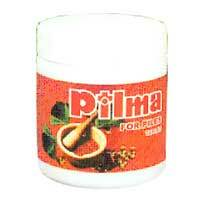 We offer Pilma Tablets at market leading prices. It can be used by all age groups – one spoon to be taken orally with water or milk or honey or any fruit juice in the night before retiring to bed. In rare cases loose motions may occur (for one or two days only) which does not necessitate discontinuation of the medicine. In such case reduce the quantity of Pilma to half spoon. This is one of the favorable signs.